Regular readers know that I don’t think highly of bitcoin. I’ve never owned any, have no intention of buying any and don’t recommend it to readers. I did an interview in December 2017 when bitcoin was around $8,000 and going up almost $1,000 per day. I said that bitcoin could go to $20,000, but that it was a classic bubble and would crash precipitously from there. That’s exactly what happened. That interview was posted on Facebook and YouTube and received over 1 million views. My case for bitcoin as a bubble was based on its nonscalability, unsustainability, high transaction costs and general lack of acceptance. You can find that interview here. My expectation was not that bitcoin would go to zero, but that it might find a floor at around $200 where it could serve as a utility token for tax evaders, criminals, terrorists and others who wanted to transfer wealth illegally. This article provides new evidence to support my view. 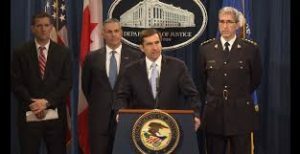 The U.S. has indicted Russian military intelligence operatives who used bitcoin as part of their schemes to spread disinformation and engage in propaganda aimed at the U.S. Unfortunately for all of those who bought bitcoin at $10,000, $15,000 or even higher prices, this is one more indication of the future of bitcoin — a last refuge for criminals and illegal operations.